Looking for sold, year-end 2018 single family home market data for the Tahoma area? 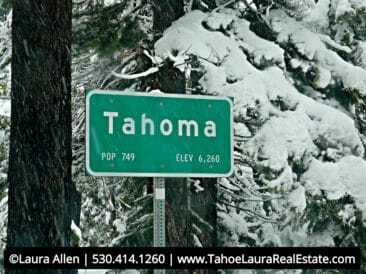 Here is the year-end 2018 real estate review for Tahoma, CA. The Tahoma real estate market conditions continue to be strong, and favor Sellers. Inventory levels of available homes for sale in Tahoma remain critically low and limited. Buyers have very few options, and it doesn’t matter what price point you are looking at, they are all limited. On January 31, 2019 there were only ten (10) homes for sale. Need help as a Tahoe Buyer? Call me call Laura Allen, 530.414.1260, for help! Single family home prices move up significantly in 2018, and part of that increase was because we had a number of record lakefront sales on both the West Shore of Lake Tahoe, and the North Shore of Lake Tahoe. Lake Tahoe lakefront homes hit new highs on the North Shore $22+ million, and on the West Shore the sold prices were even more impressive with a new high of $40 million. 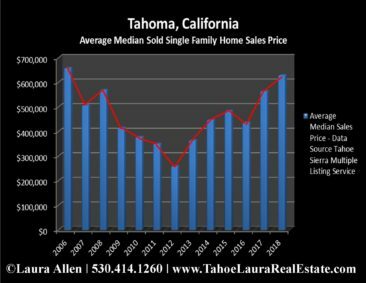 You can see on the graph below that the over-all Tahoma home price trend for the average median home sold sales price move up in 2018. 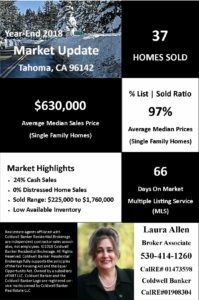 In 2018, Sellers realized approximately 97% of the their average listed median home sales price to the sold average median sales price in the greater Tahoma area. This is lower than the over-all region, which was at 98.9%. If Sellers have priced their property correctly, they will get close to their asking price. It also means Tahoe Buyers that want to be really aggressive on their offered price are going to have a harder time in this market. Days on Market (DOM) declined 16.5% from 2017 to 2018. For 2018 is the number of days on the market for single family homes is now at 66 days, down 13 days from 2017. Lower Number of Sales – The number of sales in 2018 may have distorted the over-all increase. 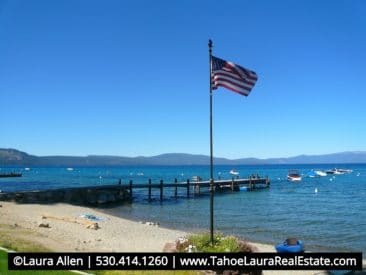 It is always beneficial for Buyers and Sellers to look at the entire North Lake Tahoe – Truckee regional single family home price trend, which was up +7.45% for 2018, with a median average sales price of $721,000 (TSMLS Areas 1-9). As a result, I recommend looking the the entire North Lake Tahoe – Truckee Region for market trends and take that into consideration when looking at smaller data sets, and area. If you already own a home in the Tahoe area and want to know what is your property is now worth? Looking for help as a Seller? Call me call Laura Allen, 530.414.1260, for a confidential consultation. Look at new listings as soon as possible. Don’t wait until the weekend. Be prepared to write an offer the same day as seeing a new listing. Decisions need to be made as soon as possible. Use a Buyers’ Agent. Work with an experienced local Tahoe Real Estate Agent. They understand the market conditions, and how other agents work and may respond. Do you have your loan approval letter? If you will need a loan, make sure your lender has approved you. If you are buying a condo or townhome in the area, make sure you are using a local lender. Using a local lender that has recently processed a loan in the complex you want to buy in will do two things for you. First, you will have the confidence that the lender has already reviewed their HOA docs and previously approved the development, which will increase your odds of the same outcome. Second, Sellers that know you have selected a lender with this experience will give you extra credit for knowing your lender is ready to go on their property. Want to see other Tahoma Real Estate Market Reports?